Have you thought about writing a book with another person? 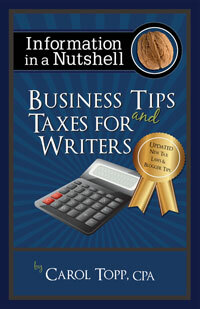 In my book, Business Tips and Taxes for Writers, I share the advantages and pitfalls of co-authorship from a business perspective. Attorney Francine Ward addresses co-authorship from a legal perspective, especially joint copyright. Before you enter into a co-authorship agreement (even verbally), you need to read her blog post first. Why is Joint Copyright Owner Status so Important? A joint owner of a copyrighted work has an undivided, equal interest with the other joint owners. What that means is each copyright owner shares equally in all profits generated by the copyrighted work. Also, each copyright author has the legal authority to make money from the joint work, as long as they account to the other copyright owner, for any and all profits generated. Did you get that? Even if you do ALL the work of promoting the book, pay for travel expenses, pay for marketing, spend hours on social media, etc. your co-author will get still their share of the profits, even if they did nothing. Francine goes onto give some great advice on protecting yourself. Read her list of tips and follow them to protect yourself! What are the disadvantages to author partnerships? Should an author release his rights to a charity?